Parker visited Gram this weekend which gave Dad an opportunity to try out the new digital camera (what a machine). 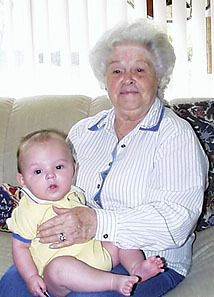 Parker looks thrilled with his visit to Gram -- he's begun to scoot along the carpet and playpen, mobility has started. Egads! Parker also started daycare this week -- Tuesdays and Fridays to start. He gets to hang around with seven other little babies about his age and basically get pampered all day long. I still get him on Mondays, Wednesdays and Thursdays so I won't go through withdrawals too much. I do get a lot more done during the work day on his daycare days too and I'll get to see the light of day occasionally. But I still miss him (it's his first day).